Sydney Dance Company in Cheng Tsung-lung's 'Full Moon'. Photo by Pedro Greig. 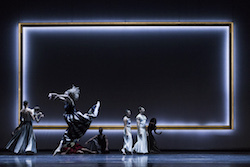 Sydney Dance Company’s latest work, Orb, was met with great anticipation and proved to be a timely and successful double bill with works choreographed by Rafael Bonachela, artistic director of Sydney Dance Company, and visiting guest choreographer, Cheng Tsung-lung, artistic director of Cloud Gate II. Sydney Dance Company’s ‘Orb’. Photo by Pedro Greig. With Taiwanese origins, Cloud Gate II is causing a stir in the contemporary dance world, and the cross-cultural contrast it provides in Orb is a cross-cultural masterstroke. Both works highlight the primacy of the circular symbols – the full moon and ocho (the figure “8”) – to blend the ancient and modern, in a search for ways of expressing the inexpressable or inarticlate feelings. 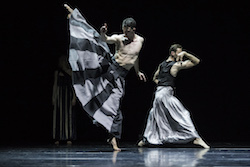 The program is in two sections, with each choreographer creating his own work with individual composers and costume designers around the concept of Orb and with the company’s dancers split between the two pieces. Tsung-lung’s Full Moon opens the evening, with the intoxication of a forest full of promise and uncertainty under a full moon. Various characters arrive, mythical, mesmerising; it feels like a southeast Asian Midsummer Night’s Dream. In fact, it is a work inspired by ancient Chinese poetry from the seventh century BC. Sydney Dance Company in Cheng Tsung-lung’s ‘Full Moon’. Photo by Pedro Greig. The individual costumes designed by Huai-chih Fan highlight both the individuality of the dancers’ expression, as well as the effortless flow of circular movements. It is as if we hear gurgling water flowing in an ancient and sacred garden. The moon gods and godesses have come out to dance in all their diversity. Reminding us of Shiva, or an Indonesian sculpture, draped in pieces of red cloth, Latisha Sparks’s dancing is mesmerising, bold and beautiful. In her powerful dance, there is almost a magical strength in her movements as she leaps and twists, yet remains closely connected to the ground. In sharp contrast to the Full Moon mysticism and dreamy surrreality, Bonachela’s Ocho transports us to the gritty super-reality of a city, with its imposing concrete solidity and the concept of separate spaces – “inside” and “outside”. We see the eight dancers inside a glass room, looking out at the world, looking at us, the audience. And as they open the door and cross the line between inside and outside, each dancer’s movements search to express their own unique relationship with the stark urban reality in an attempt to find their own way of being, their own path. Within this architectural landscape, the individual “watches and is watched”. It is the individual who must defend and find his place in this harsh landscape, and it is the humanity of the individual that Bonachela seeks to explore in this work. Sydney Dance Company in Rafael Bonachela’s ‘Ocho’. Photo by Pedro Greig. 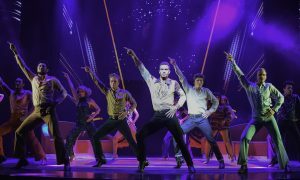 The circular, supple movements juxtapose against the harsh angular and geometric urban setting, brilliantly collaborated between lighting designer Damien Cooper and set designer David Fleischer. The musical score by Nick Wales is a surprising but powerful mix of “disguised trumpets” to provide an undercurrent of power and authority, followed by haunting dreamtime singing. 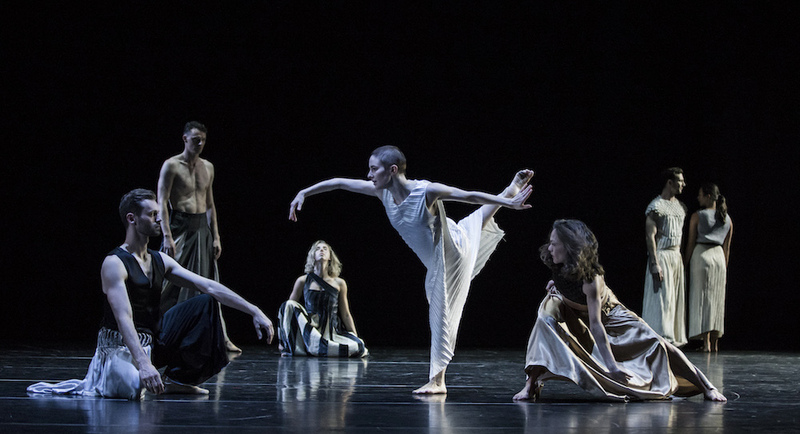 In this work, Bonachela has departed from lightness and lyricism, and has excelled in producing a grounded, gritty dance piece; each dancer is mesmerising and intriguing. The program in its totality seems to juxtapose contrasting elements: the mythical vs. the real, the natural vs. the artificial, the forest vs. the city, mortals vs. immortals. But in his commentary, Bonachella suggests that by turning the Ocho, or figure eight, on its side, we come to the infinity symbol, with the two works flowing into each other, into an infinite loop orbiting the sun and the moon – the cycle of life. Happy Birthday, Capezio: Celebrating 130 Years!